Guacamole is a well-known avocado dip. Many of you will agree. I agree too. I serve it as a dip when we have visitors. However, when I am alone, I like to have my guacamole as a one inch thick spread on some crisp bread. A couple of those is one of my favorite summer lunches. Guacamole is one of those foods that surprised me by their simplicity when I made the first time. It's something that you can't get wrong. Even on your bad kitchen days. I have never tried any other recipe than Ina Garten's. I found this one so good right from the beginning that there was no need to experiment. Guests have praised this guacamole too. Perhaps there is just one thing I like to point out: raw onion and garlic I can only have in tiny amounts (especially when I eat it at lunchtime) as I will have their taste in my mouth for the rest of the day. I go a little easier on them when eating it earlier in the day. But otherwise it is just what you need: full of flavor, still raw with all the ingredients. Filling, yet light on the stomach. Extremely tasty and healthy. Just right up my alley. 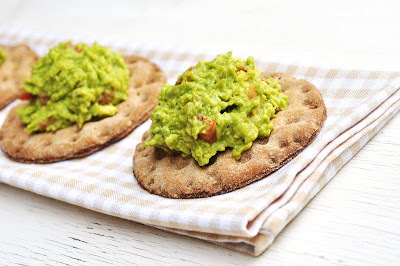 For all these reasons, I put the guacamole inch-thick on my crisp bread. In her book and on the Food Network website the recipe uses 4 avocados. I found that too much (even when we have guests who would only eat it as a dip) and made adjustments toward one avocado. It can easily be doubled or tripled or use the original recipe with 4 avocados. In any way, it will be yum!! That I can promise you. Cut the avocado in half, remove the pips. Scoop the flesh out of their shells into a medium bowl. Mash with a fork. Immediately add lemon juice, Tabasco sauce, onion, garlic, salt, and pepper and stir well. Add the tomatoes. Mix well and taste for salt and pepper.